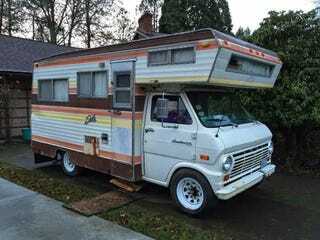 Old Class C RV off of Craigslist as living quarters. It has a big enough kitchen to be practical, and I can solve the wi-fi solution by getting Teksavvy Sky Fi Titanium 10 with unlimited bandwidth. Considering the average rent for a one-bedroom in the area I’m looking at is $1k/mo, and then the cost of furnishing the place, doesn’t it just make sense?